For over 30 years, on banjo and pedal steel guitar, Gordon Stone has been writing his genre-crossing music, recording 5 studio albums of his own original material. Gordon was named "Best Instrumentalist" two years in a row and won an Emmy for Jay Craven's VPT series, "Windy Acres" soundtrack in 2005. He has recorded and performed with some of the country's most influential musicians in the bluegrass and jam world - Tony Trischka, Vassar Clemmens, Sam Bush, Peter Rowan, Phish, Mike Gordon, moe., Strangefolk, Max Creek, to name only a few! The Gordon Stone band can provide a variety of musical instrumentation for your event: banjo, pedal steel guitar, electric or acoustic bass, mandolin, violin/fiddle, sax, drums, african percussion instruments, vocals, and guitar. 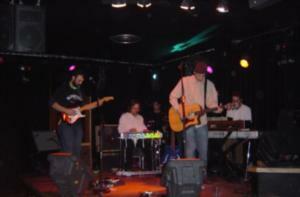 They cover a variety of genres including: bluegrass, country, funk, rock, latin, folk, world music, rockabilly and more! Please note Gordon Stone Band will also travel to South Burlington, Winooski, Colchester, Shelburne, Williston, Essex Junction, Saint Albans Bay, Saint Albans, Charlotte, Hinesburg, Port Kent, Highgate Springs, Jericho, Richmond, Willsboro, Essex, Huntington, Keeseville, Milton, South Hero, North Ferrisburg, Au Sable Chasm, Underhill, Westford, Whallonsburg, Ferrisburg, Peru, Clintonville, Fairfax, Grand Isle.